Yesterday, the local farmer’s market stands offered a beautiful plethora of the most unusual summer squash, both zucchini and yellow squash. This is a great recipe for the gardener, as well, who is swimming in these vegetables and fresh herbs. It is a colorful crowd pleaser that doesn’t disappoint. 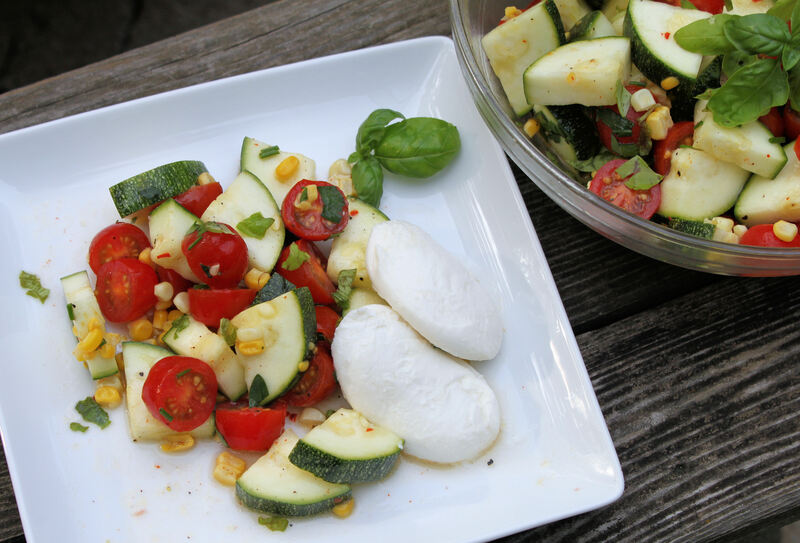 The simplicity of the salad is perfect for last-minute summer entertaining. This is a favorite as it is colorful and fresh with a nice tangy lemon dressing. For the dressing, mix together the lemon juice, salt, and black and red peppers together in a bowl. Whisk in the olive oil until blended. Set aside. Cut the zucchini (and/or squash) in half crosswise and then lengthwise so you have four quarters. Then slice the quartered zucchini crosswise into ¼ inch pieces. 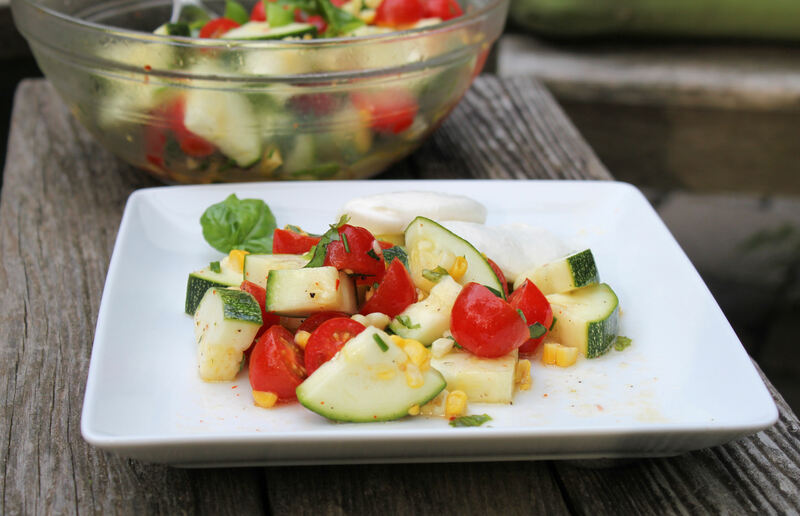 Mix together the zucchini, tomatoes, corn, and dressing. Refrigerate for at least 20 minutes. Once ready to serve, mix in the fresh herbs. Taste and adjust accordingly with a little salt and pepper or additional herbs. 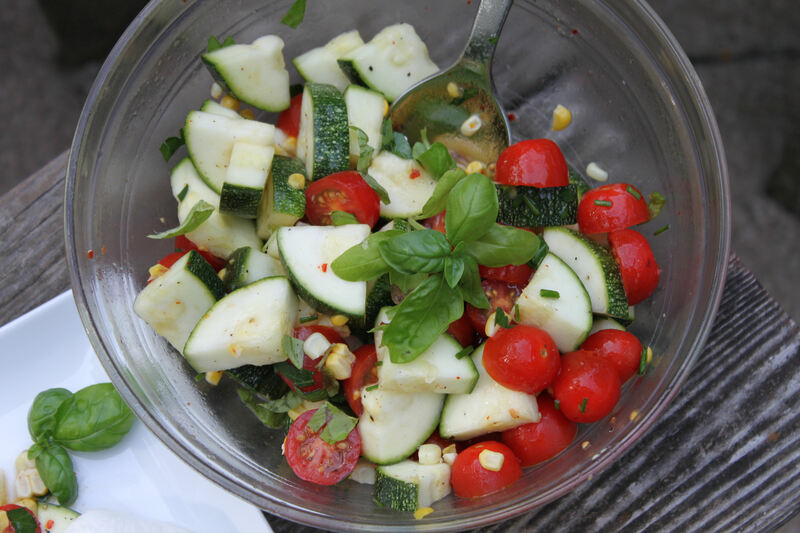 This entry was posted in healthy options, salads and dressings, side dishes, vegetarian and tagged 4th of july, bbq, fresh, lemon vinaigrette, picnics, recipes, salads, side dishes, summer squash, tomatoes, vegetables, yellow squash, zucchini. Bookmark the permalink.